Air Niugini General Conditions of Carriage (Passenger and Baggage), available on request, and any applicable tariffs filed by Air Niugini with regulatory bodies. Air Niugini’s oral or written directions to passengers. In the event of any inconsistency between these Terms and Conditions and the General Conditions of Carriage, the General Conditions of Carriage shall prevail. b) If Air Niugini issues a ticket boarding pass for another carrier, it does so only as an agent for that carrier. c) Unless otherwise stated, a normal full fare ticket is valid for one year from the issue date. Special fare ticket is subject to further terms and conditions applicable to that fare type travel. d) Air Niugini will use efforts to carry you and your baggage reasonably in accordance with the date and time of the flight(s) specified, but does not guarantee it will be able to do so. Schedules may change without notice. Check in by the required check-in time. Those other carriers’ employees, agents and representatives, and Air Niugini hold that benefit on trust for them, and can, if requested by them, enforce it on their behalf. g) If your checked baggage on an international Air Niugini flight has been lost or damaged, you must notify Air Niugini in writing within 7 days and in the case of delay, within 21 days of delivery. If a whole item of your checked baggage on a domestic Air Niugini flight has been lost or destroyed, you must notify Air Niugini in writing within 21 days, or if only part of an item has been damaged, lost or destroyed, within 3 days. On Air Niugini International and Domestic Flights each passenger may carry, in addition to the free allowance, the under mentioned articles only when retained in the passengers’ custody, except item 7 that may be carried in the passenger baggage and cargo compartments of the aircraft. 7. A fully collapsible invalid’s wheelchair and braces or other prosthetic device for the passengers use; provided that the passenger is dependent upon them. Any item that purports to be a specified article listed above, but does not visibly conform to the description set out must be weighed and such weight included in the total baggage weight. All other articles including overnight bags, briefcase, typewriter, personal radios, ladies vanity or cosmetic cases, hat boxes, infant collapsible pram, wheelchairs, heavy cameras and reading matter which cannot reasonably be carried during the flight, must be weighed with the baggage and subjected to normal rules. These Items must be weighed, and if necessary, charged in accordance with valid tariff. Cabin baggage dimensions vary in different countries and are subject to Government and Airline regulations in force at the time of travel. Passengers (except infants*) on Air Niugini are allowed the following baggage. 1. Business Class: Baggage Allowance for NORTH AMERICA ticketed and origin passengers will be 2 pieces at 32kg each piece. (total dimension of the two pieces must not exceed 270cm (106in) with no one piece exceeding 158cm (62in). 2. Economy Class: Baggage Allowance for NORTH AMERICA ticketed and origin passengers will be 2 pieces at 23kg each piece. (Total dimension of the two pieces must not exceed 270cm (106in) with no one piece exceeding 158cm (62in). 3. Baggage allowance above will apply where carriage is on the same day or (within 24 hours) or next scheduled PX flight day. Flight numbers needs to be shown on the bookings to ensure all stations are aware its same day travel or within 24 hours or next scheduled PX flight day. 4. Where an intended stopover is taken enroute, applicable baggage allowance for each sector/carrier will apply. 5. Baggage allowance above will apply where carriage is on the same day (within 24 hours) between POM PX International arrival & PX domestic departures and vice versa. Infants – Less than 2 years of age for Papua New Guinea domestic and International travel. To/From North America Infants not entitled to a seat shall additionally be allowed one checked piece provided that the sum of the 3 dimensions shall not exceed 115cm (45in) and that the weight shall not exceed 10 Kg. Infants shall additionally be allowed one checked or carry on fully collapsible stroller/pushchair or infants carry basket or infant’s car seat which may be carried in the passenger cabin subject to the availability of space. Perishable or fragile items which include and are not limited to cash, precious metals, jewellery, laptop, camera, mobile phone, I-pad or any other electronic device of value, negotiable papers, business documents or samples, securities or other valuables. Except as provided for under the relevant provisions in 4 and 5, Air Niugini will not be liable for the loss, damage to or delay in the delivery of any fragile or valuable Item/s that are packed as checked baggage whether with or without the knowledge of the airline . We encourage passengers to ensure valuables are taken as hand carry or are on them. Please be aware that Storage limitations apply on some Air Niugini operated services. Domestic travel is defined as travel not combined with any international flights. International travel is defined as travel between two or more countries including any flights within those countries when they are combined with any international flights. For International travel, a passenger using Air Niugini connecting services is entitled to the applicable international free baggage allowance. Additional baggage may be carried at a fixed baggage rate per kilogram in excess. An excess fee will be collected for each kilogram of baggage over the designated free baggage allowance and for each piece that is overweight. a) If your trip has a destination or stop in another country other than the one from which you depart, a treaty known as the Warsaw Convention may govern the liability of all airlines involved in your trip and may limit the amount of damages that can be recovered for your death or injury. These limits can be as low as K30, 000. However, many airlines have voluntarily agreed to waive those limits (in whole or in part). b) Air Niugini will not rely on the limitation in Article 22(1) of the Warsaw Convention or the Warsaw Convention as amended at The Hague for any claim for recoverable compensatory damages arising under Article 17 for that Convention. c) Air Niugini will not rely on any defense under Article 20(1) of the Convention for that part of any claim for recoverable compensatory damages arising under Article 17 of the Convention that does not exceed 260,000 Special Drawing Rights. Otherwise Air Niugini will rely on all other defenses under the Convention. d) In addition, in cases of death or bodily injury, if required by law, Air Niugini will make advance payments to the person entitled to compensation, if required to meet immediate economic needs, in proportion to the hardship suffered. e) Liability for loss, delay or damage to baggage is limited to about K20 per kilo for checked baggage and K400 per passenger for unchecked baggage. Carriage wholly within Papua New Guinea, which is not international carriage as defined by the Warsaw Convention, is subject to the provisions of the Civil Aviation (Aircraft Operators’ Liability) Act 1975 as amended. Air Niugini’s liability in respect of the death or injury of any passenger is limited to K30,000, and in respect of baggage is limited to K300.00 per passenger (for checked baggage), and K30.00 per passenger (for cabin baggage). Air Niugini does not guarantee you any, or any particular, seat even if your reservation is confirmed. You must accept any seat allotted on the flight even if this involves a downgrade, or wait until the next flight on which a seat is available in the class of service paid for. There is a chance a seat will not be available on a flight even if your reservation is confirmed. This is due to the common practice in the airline industry of overbooking. Air Niugini’s policy on overbooking is available at Air Niugini international airport ticket counters and boarding gates. If there are not enough volunteers Air Niugini will deny boarding reservation holders in accordance with its policy. People involuntarily denied boarding may apply for compensation in accordance with that policy. Travel within Papua New Guinea and Internationally – the price of your ticket may include significant amounts of taxes, charges and fees imposed on air transport by government, authorities and airport operators (in the fare, e.g. Goods and Services Tax, or shown separately as a TAX/FEE/CHARGE). You may also be required to pay additional taxes, fees or charges not marked on your ticket. Personal and baggage insurance is recommended. Details may be obtained from Air Niugini, or your travel agent. Air Niugini Security, airport security or a member of the police force is empowered under the CAA Act 2000 section 268 (1) (c) and (2) to carry out search on a passenger and his/her baggage with the consent of the passenger before carriage. Air Niugini may refuse carriage of the passenger and his/her baggage if the passenger declines to be searched. In circumstances of a high threat level, passengers will be asked to identify their baggage for re-screening, where passengers cannot be located in a reasonable timeframe, the search will be carried without the passenger’s presence/consent but in the presence of a senior airline staff who is on duty and an aviation security officer. Air Niugini reserves the right to refuse carriage to any person who seeks to travel in violation of applicable law, tariffs or the General Conditions of Carriage, or is otherwise in breach of these Terms and Conditions, or under the influence of drugs or alcohol, or it is necessary for the safety or comfort of other passengers or for the protection of property. Smoking is not permitted on any Air Niugini aircraft. 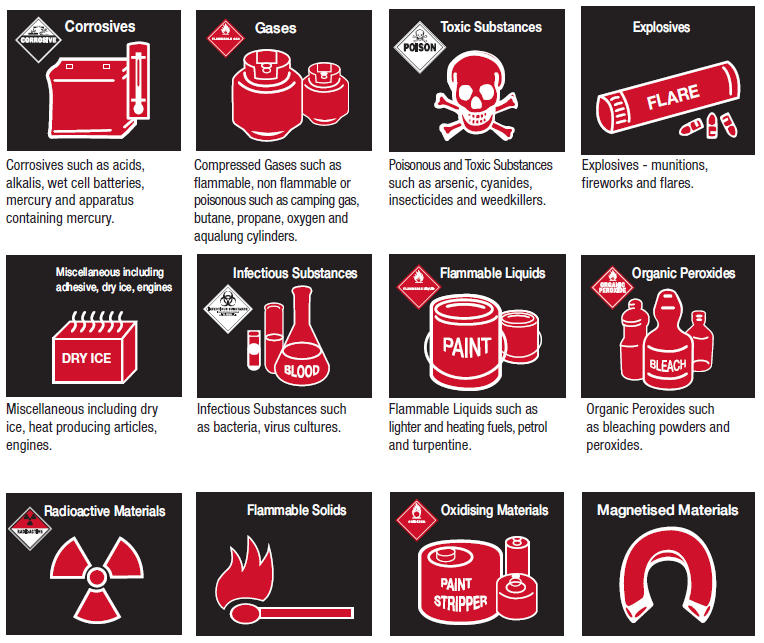 For safety reasons, the following types of Dangerous Goods must not be carried in your baggage. These goods fall into the categories shown below. Briefcases and attaché cases incorporating Dangerous Goods such as lithium batteries or pyrotechnic devices are totally forbidden. Disabling Devices such as mace, pepper sprays etc, containing an irritant or incapacitating substance are prohibited on the person, in checked baggage and carry-on baggage. Medicines and toiletries in limited quantities and alcoholic beverages may be carried in checked baggage or cabin baggage – maximum 2 liters or 2 kilos. Small arms, sporting munitions and dry ice may be carried in limited quantities under certain conditions. Please apply to Air Niugini for details. It is important for you to check in within the required time to be given a boarding pass for your flight. Boarding time is 30 minutes before departure. For travel on Air Niugini domestic flights within Papua New Guinea, you can now receive your outbound and return boarding passes when you check-in for your outbound flight, provided you are travelling on an e-ticket, have no checked baggage and return within 12 hours. Please ensure you are at the boarding gate 30 minutes before the scheduled departure time on your boarding pass, otherwise your seat may be forfeited. If you need to change your return flight and the fare conditions permit changes, please call Air Niugini Sales on the numbers listed, your Travel Agent or see a Customer Service Agent at the airport. You will need a new boarding pass. Report 90 minutes before Estimated Time of Departure with Baggage, 60 minutes without baggage for documentation verification.